They will not let the terrorists win! Most companies named ISIS have been struggling with how to deal with the now toxic moniker. But some, surprisingly are not. The Institute for Science and International Security, or ISIS, is steadfastly sticking with the name. “We’re not going to change our name,” David Albright told the National Journal. “We’re going to get through this.” The group looks at global nuclear programs and has a staff of six. Their Twitter handle is @ISISNuclear. “Its recent work has been largely focused on Iran’s nuclear program, and the group has been looking to get a little extra publicity. But not like this,” writes the National Journal. Ha… yeah. Seems like in this case, organizations would want to take the path of least resistance in the interest of their brand. Experts say we’re looking at months (at least) of efforts to shut ISIS down. And whatever happens, the group will forever be associated with the horrific torture and murder of innocent people. That’s a lot to get through. These folks are fighting an uphill battle. 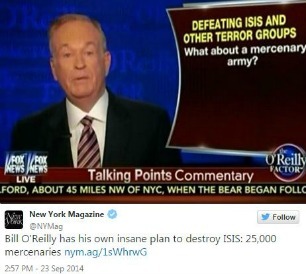 At this point, the word ISIS has become synonymous with the terror group. Try as you might, it’s an association you’ll never fully escape. The better strategy is to find a way to rebrand the organization in a way that either provides new marketing opportunities, such as a campaign launch or an explanation of the company’s history and mission, or doesn’t deviate too far from the current branding. For instance, would it be so terrible to go from “Institute of Science and International Security” to “Organization for Science and International Security”? Probably not. As for Ms. Martinez… well good luck with that.